5 Things To Do In Atlantic city, Casinos, Beach, Boardwalk, Helicopter rides, and the Aquarium. Have fun and enjoy your stay In Atlantic city. Traveling can be fun or a nightmare, taking some time to plan your trip can make the difference. 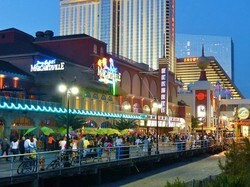 Atlantic city is a great nightlife town that is gearing back towards the family resort it once was. You have the beach, boardwalk, piers,shopping, and the Aquarium for the family. At night you have numerous clubs and shows in each casino as well as the main attraction - Gambling. The casinos have parking, beautiful rooms, restaurants, and are minutes from the beach and boardwalk so you can bring the family and stay with confidence. Atlantic city has over 10 Casinos to chose from with three others closed at this time. There are plenty of gambling, shows, and restaurants to choose from so you will find something you will like. I will go to a show and gamble since I am there, they have nice rooms to stay at if you are from out of town. This makes coming to the city convenient because you can park and have everything you need where you are staying. Atlantic city has the only free beach in the area and it is as nice as the rest. You will be near the boardwalk and casinos so you can get refreshments or use the rest room. There is a bar and dance club located on the beach and they have free concerts too. Parking is in the casino or you can go to the south end near Ventnor To park on the street and avoid the city. The boardwalk runs from the north end near the seawall all the way to Ventnor, It is 4 miles long through Atlantic city and runs 1½ miles into Ventnor. Through the city it is lined with casinos and stores to shop or eat at, You can get just about anything you need and a few things you do not need there. It has rolling chairs pushed by local residents and a tram car system to take thos unable to walk that distance around. The boardwalk has piers with rides and arcades for the younger family members as well as yourself. There are games to play and rides for children and adults, even high ones like the slingshot and helicopter rides. Fun for the whole family. Atlantic city has an Aquarium near the seawall that shows all the local fish and reptiles, They have tanks that you can pet the sting rays and sharks. Outside you can see the old diving bell that people use to go under the water in off the pier. Atlantic City has a rich history of being a successful resort town, it had all the great performers like Dean Martin, Sammy Davis Jr., Frank Sinatra, and so many more. There were the piers with the diving bell that took people under water and the diving horse that dove into a pool with a woman on it's back. Of course you have to mention the boardwalk with the rolling chairs and famous places like Peanut World and Fralinger's Candy. The city has two Pikes and an expressway with bus routes on two of them, and a train station with train service that stops throughout South Jersey and into Philly. There is a jitney service that travels through the city on Pacific ave. mostly to get visitors where they are going, This fleet now runs on natural gas. I grew up in Atlantic city and seen it go through many changes, some I like and others I hate, I have to say it has become a nice place to visit or vacation at. The amount of available things to do is staggering, this could have been a list to 100 and still not named them all. If you liked the 5 things to do in Atlantic City then here are a few more suggestions you may like as well. I've been to Atlantic CIty, I like the beaches and boat tours. I have never gambled although I have heard it is nice in Atlantic city, it is a lively town and I would go back again. Great review. You forgot to mention the lighthouse. It was very nice and dog friendly too,you also get to meet Buddy a gentleman who's been telling everyone about the lighthouse history. Love your company Buddy. iggy, Thank you for the Atlantic City tour! My priorities when I go there will be the aquarium, the beach, the boardwalk and the wildlife refuge. Greaat information. I have yet to go that direction. Make money with photography, Use your hobby or skills to make money and enjoy doing it. Many travel the country roads of New England leaf peeping in the fall when the colors are beautiful, but New Jersey is also a beautiful place to enjoy fall foliage tours.